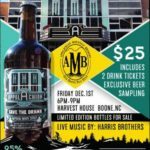 On Friday, December 1st, a benefit for the Save the App Theatre campaign was hosted by Appalachian Mountain Brewery and Cidery– at Harvest House featuring a silent auction and entertainment from the Harris Brothers. One wintry night back in 1950, the Appalachian Theatre was severely damaged by fire due to a faulty popcorn machine. Sadly, the theatre never fully regained its claim to the spotlight. After many struggling years,it closed its doors in 2007 (for the full history of the Appalachian Theatre click here). Thankfully, a campaign to save the App Theatre began in 2013. A group of leaders from Watuaga County began conducting a capital campaign to raise support for the revitalization of the 1930’s theatre. Led by John Cooper, the President of Mast General Stores, Keith Martin, and Frank Mohler, this group has a long list of individuals passionate about saving this wonderful piece of High Country history! The first goal of Appalachian Theatre of the High Country (ATHC) was to give the theatre a much needed make-over! Thanks to VPC Builders, the initial stage to bring the theatre back to its “original” glory is complete! The project management team and Clearscapes Architecture worked diligently to keep the reconstruction historically relevant. Lincoln Boone looking precious as ever! 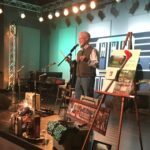 Besides ticket sales, the fundraiser’s main component was the silent & live auction that featured goodies from local High Country Business. Thanks to all of the attendees, which included some of our own (Melissa Boone, Jay Vincent, Chad Vincent, Lynn Vincent, Lienn Swearingen), the event was great success! The auction was emceed by auctioneers Jesse Miller and Cullie Tarleton, and raised approximately $50,000! This brings the nonprofit’s fundraisers totals to over 8 million dollars- a gracious 3 million over a consultant’s projected earnings! John Cooper, Chairman of Mast General Stores and head of the App Theatre Board of Trustees, announced that the final phase of construction is set to begin now that the capital campaign has topped $8 million, three million dollars more than a consultant estimated could be raised for the project. Photo by Kate Cahow. 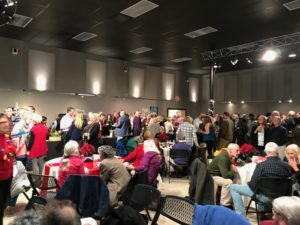 A sold-out crowd of over 400 theatre patrons enjoyed food and beverages provided by Boone area restaurants that will benefit from increased customers from various events at the Appalachian Theatre. 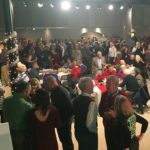 The first-ever event, which included both live and silent auctions, raised $50,000 for the theatre. Photo by Kate Cahow. 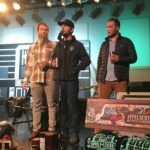 Danny Wilcox, center, director of retail operations at Appalachian Mountain Brewery, unveils the “Save The Drama” imperial stout during the beer release party to benefit the Appalachian Theatre. On the left is head brewer Chris Zieber with master brewer Nathan Kelischek on the right. Photo by Kate Cahow. The Appalachian Mountain Brewery’s mission is “…to brew quality beer; in hopes to support and vitalize the community of the Appalachian Mountains as well as to lead the country, by example towards fulfilling the potential we all possess.” AMB brews a variety of quality beers with names that reflect North Carolina Heritage. These include “Long Leaf Pine” (a reference to NC Toast) and “White Dot” (referencing the hiking trails on the parkway). They put a strong emphasis on local business and seem to have their hand in many High Country events! Danny Wilcox of AMB, add his creative touch by suggesting a celebratory beer to help with the theatre’s fundraising. Titled “Save the Drama”, the beer is a white imperial stout and has it’s own commemorative bottle- the front of Appalachian Theatre! All of the profits from the beer sales were also donated to the campaign. Click here to learn more about AMB! What’s all the buzz about the Harris Brothers?! The renowned Harris Brothers, Reggie and Ryan, known for their exceptional talent throughout the Southeast! A local band of two brothers, raised in Western North Carolina, have been playing professionally as a duo for more than 20 years! Growing up, they loved singing and performing together. 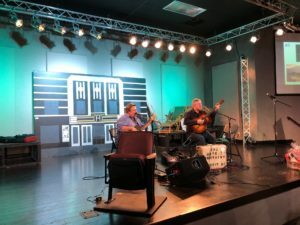 Their variety of music consists of a number of genres including traditional roots music, rock & roll, jazz, blues, Appalachian mountain music, vintage country, and bluegrass. 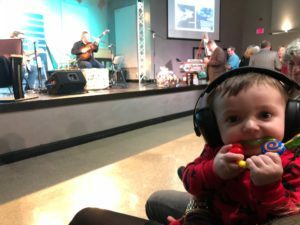 They love all kinds of music, so they’re bound to play something everyone can enjoy! The brothers are known to perform at the outdoor concert series in Blowing Rock, “Music on the Lawn” at the Inn at Ragged Gardens.. If you do go, it is likely that you will run into Jay Vincent! Jay and his wife, Lynn, are avid attendees to the summer concert series and big fans of the Harris Brothers! Check out one of Jay’s favorite songs the brothers cover, Dire Straits’s “Sultan of Swing”! Click here to learn a little more about the Harris Brothers.